In my lifetime, there have been three national or international tragedies that have rocked me back on my feet. I'll never forget where I was when they happened, who I was with as the events unfolded, or the TV coverage that followed for weeks. The first was the explosion of the Space Shuttle Challenger in 1986. I was in 8th grade and in English class. The second was the death of Princess Diana over Labor Day weekend in 1997. We were at my cousin Lesley and her husband Bart's house in Tuscaloosa, Ala. The third was the attack on the World Trade Centers in 2001. I was waking up to go babysit for a friend's children here in Birmingham. I've been to Manhattan several times since that day, but I haven't made it to the Ground Zero memorial site yet. However, Thrifty Decor Chick has, and although I typically visit her blog for design and decor inspiration, I think my favorite post is one from yesterday. She chronicled items from the memorial museum, and I wanted to share the post with you today. 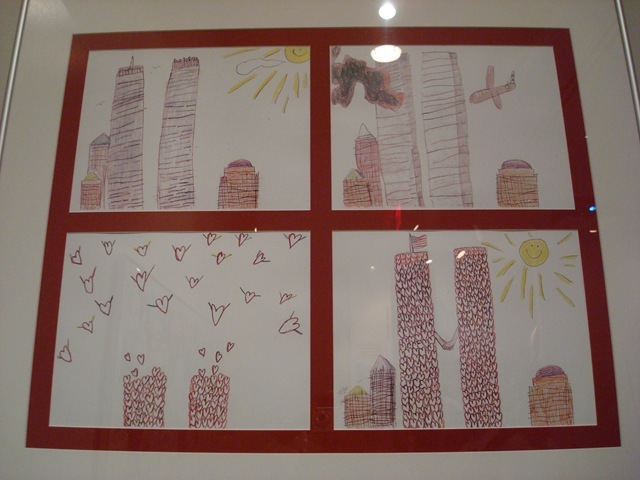 I was especially moved by the children's artwork that's displayed there. The twin towers holding hands? The buildings composed of hearts, flying up to Heaven? Never have crayons been so powerful. Today, please take a moment to remember those who were taken from their families. Amen. I was in the 8th grade when 9-11 happened. I blogged about it also. I hope to make it to Ground Zero one day and I'd love to see all the artwork from the children. Kerin, I hope to go one day, too. I have a feeling I'll bawl my way through it, but I really want to go.